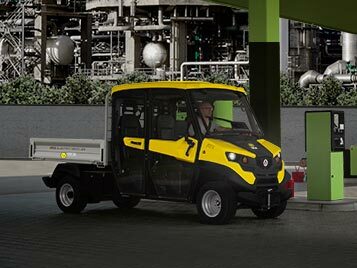 Alke’ Electric Vehicles are powerful and reliables. They are able to deal with the most difficult rises and can satisfy your own needs. 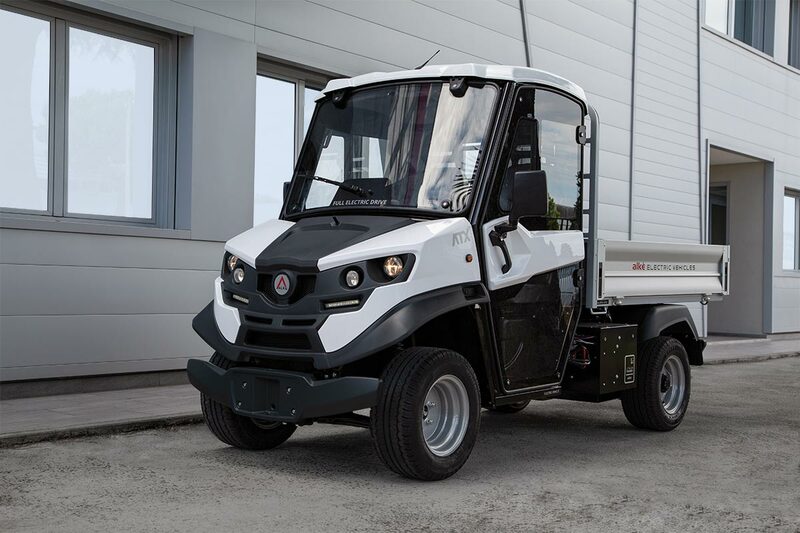 Top Performance: the European N1 type-approved ATX vehicles bring performance onto the road which was previously unheard of in vehicles of the same category: a load capacity of up to 1,630 kg, a towing capacity of up to 2,000 kg, and a maximum weight of 4,500 kg. 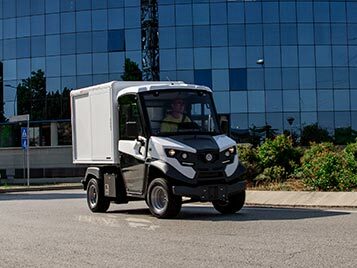 High autonomy: Alke' ATX electric vehicles have an autonomy of up to 150 km and, thanks to an approved fifth wheel, can be used with semi-trailers. 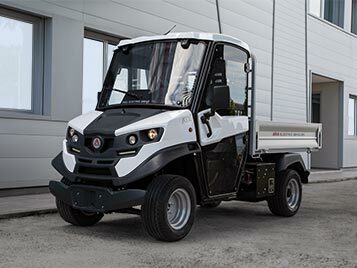 Low consumption: LED daytime running lights, low consumption road driving tyres and motor with ECO settings to reduce on-board energy consumption as far as possible. Versatility: 3 sizes of cargo bed: 130x123 cm, 180x123 cm and 200x140 cm. Over 100 different configurations: the list of configurations is growing all the time and there are currently more than one hundred possible options for both 2 and 4 seater models as well as for left-hand and right-hand drive. 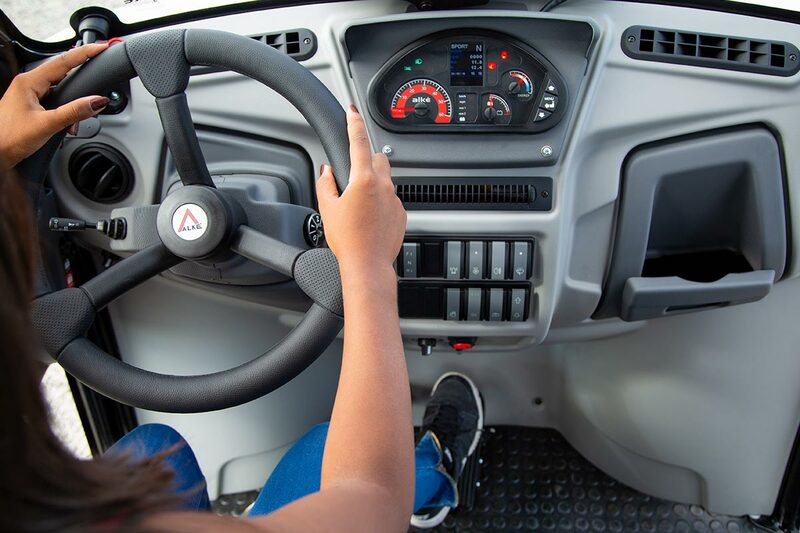 Maximum flexibility as far as batteries are concerned: the ATX vehicles come with 6 different battery options ranging from lead and gel to lithium. 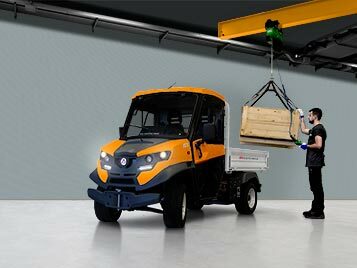 If you have special autonomy needs, you can choose from high-capacity battery packs, fast-charge systems or multiple battery packs with a battery swap system. 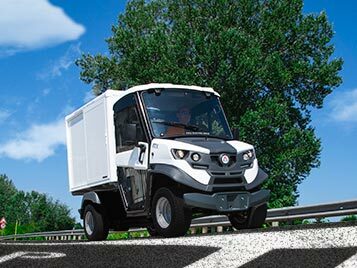 A new generation of electric vehicles exists that is able to put in the field performances that are on a par with and in certain contests superior to the conventional diesel or petrol vehicles of the same category. 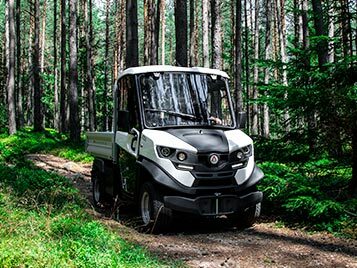 It is the case of the ATX E series, professional electrical vehicles designed to be used in the hardest and most demanding conditions. 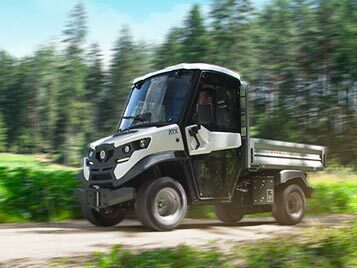 Alke' electrical vehicles combine silence and zero pollution to a real working capacity. 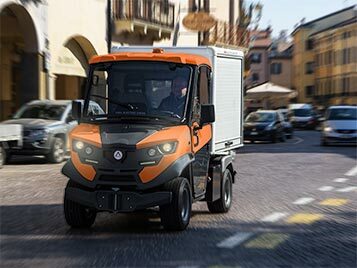 It is not by chance that a growing number of sectors are starting conversion procedures of almost their entire fleet of vehicles to high performance electrical vehicles such as the ATX E.
The greenest and quietest waste collection vehicles for urban areas, sport centres, airports, among others. 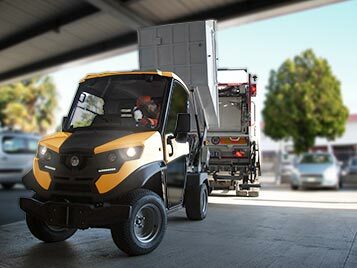 High performance, silent and environmentally friendly: perfect for the transport of goods in urban areas. 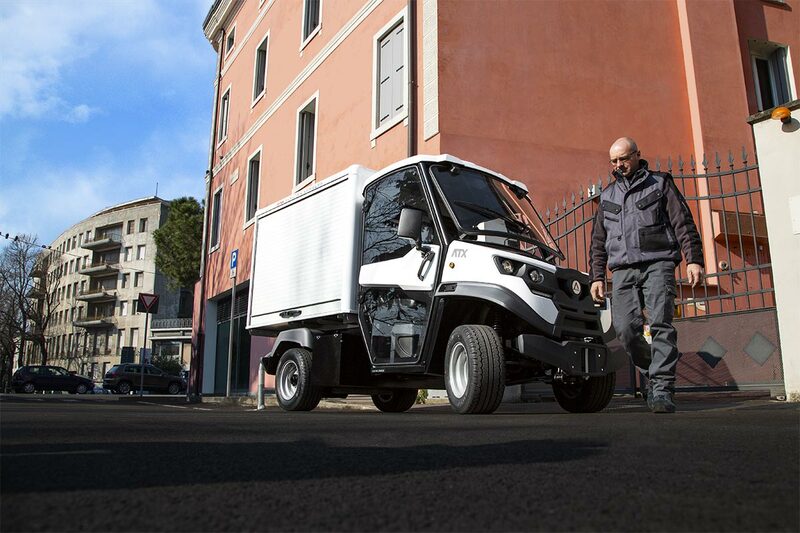 It makes a real difference being able to move and operate without limits of time or space within residential areas, tourist structures, parks and golf clubs, just as in areas within civil or commercial airports, without disturbing visitors or operators residing in these areas. 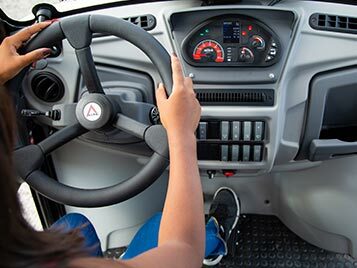 The investment for an ATX E is re-paid in average terms by the maintenance costs, which are must lower if compared with equivalent diesel and petrol vehicles: maintenance is almost inexistent and there are noteworthy savings in fuel consumption. 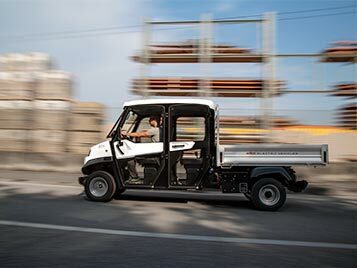 Technical life, in working hours, of an electrical vehicle of this type is generally double, if not triple, with respect to a conventional fuel vehicle. 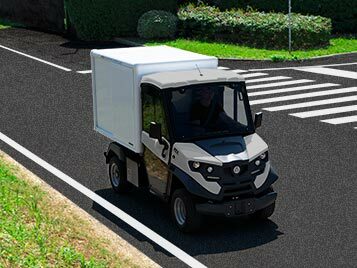 Zero-emission and compact cargo vans to improve transportation in cities and historical centres. What is the price of a golf car? 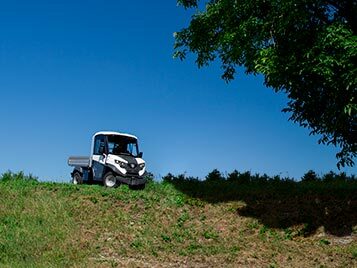 The price of electric golf cars is determined by several factors that we explain here. 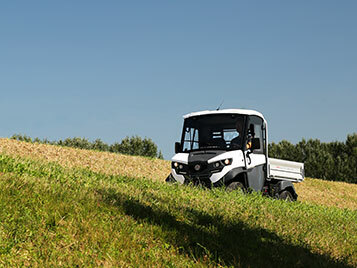 Small off-road transporters ideal on large estates, also in hilly areas, and on eco-sustainable farms. Small vans without limits to circulation. 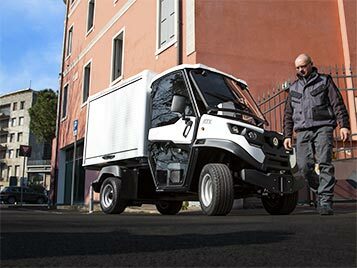 Ideal for last mile urban logistics. 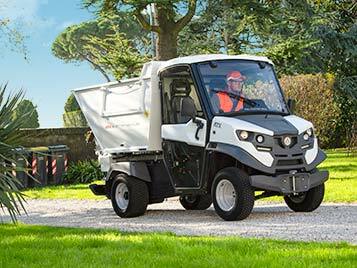 More and more municipalities have been supplying themselves EVs to carry out separate waste collection. 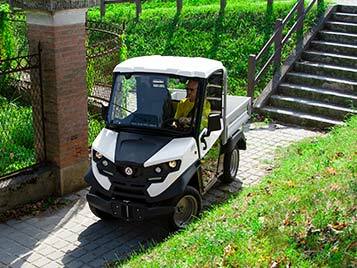 Alkè ATX electric vehicles with rear-wheel drive have performances comparable to equivalent 4WD diesel.